So Borders had a 40% off cook book sale and I went a little crazy. I can't tell you how many books I bought or you will never be able to think of me as a sensible person again, but one of my purchases was a book devoted to Macarons. It is gorgeous to look at and I was swept away by the exciting sounding flavour combinations and beautiful photography. Then after I got the book home I noticed the basic recipe for each macaron is quite different from the one I use and does not require a sugar syrup to be made. Well I thought to myself, I can give this a try, it seems much simpler than the recipe I normally use. and so it began, I followed the recipe and made macarons, they were ok, they rose and gained the little frill/ feet, I was able to remove them from the paper. If I had never made macarons before I might have been jumping for joy, but instead I was a bit cranky I had wasted all that almond meal on mediocre macarons. Melodramatic much??? The recipe I usually use is a little more complicated - it requires more equipment. 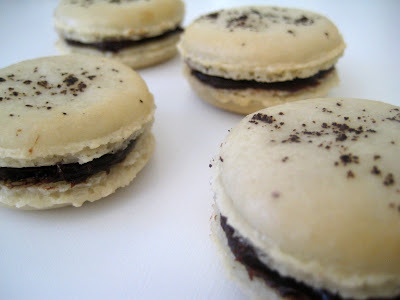 But for me I think the extra effort is worthwhile and results in a better macaron. For some the recipe below might be perfect as it requires little more than a bowl, spoon, spatula, sifter and hand held electric mixer and way less mixing time (although more resting time). Also everyone has a different taste preference and I admit to being a little harsh. My trustee tasters who received the macarons thought they were lovely and some preferred the bitter coffee to the sweet rose. 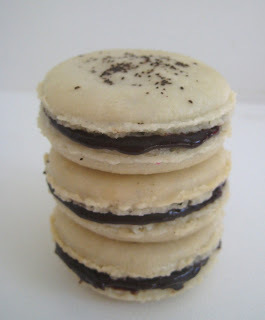 So I will share the recipe with you, but I do recommend clicking here to see my other macaron recipe which for me would win hands down in a macaron bake off every time. This recipe is adapted from Macaron by Alison Thompson, it is a beautiful book and I would buy it again (and at 40% off like I got it in a heatbeat). As I said before it has many gorgeous pictures and wonderful flavour combinations and as a bonus many of the fillings use up the egg yolks. I actually used a different filling than recommended. So what lessons did I learn today. Don't judge a book by it's cover. Easy is not always better. Stick with what you know. Well none of the above, I'll still be buying cookbooks for the beautiful photography and life would be too boring if I never tried anything new. But I did learn to love my other macaron recipe just a little bit more. Optional step - Combine icing sugar and almond meal in a food processor and pulse a few times. Sift icing sugar/almond mixture and discard anything remaining in the sieve. If you are discarding a lot of almond, try to replace it with a little more sifted almond. Whisk egg white with an electric mixer until stiff peaks form. Fold in sifted almond and sugar. 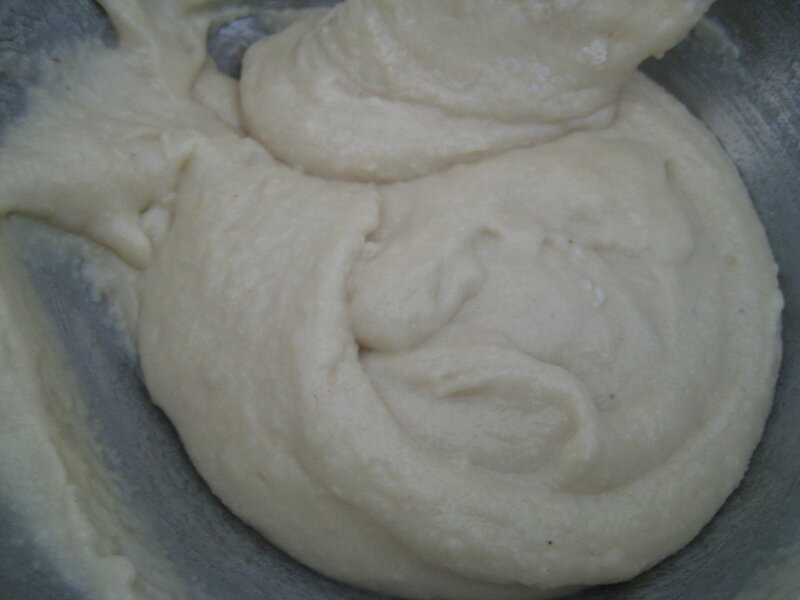 Fold until the mixture is glossy and moves slowly when the bowl is lifted. Spoon mixture into piping bag and pipe 3cm rounds onto the trays, spacing them approx 3 cms apart. Tap the trays firmly to remove any air bubbles (eek at this stage the macarons had a couple of largish air bubbles which disturbed me so I burst them with a toothpick and smoothed the macaron over - not sure what the macaron fanatics would say about this behaviour). I sprinkled some finely ground coffee onto the tops at this stage, but it is optional. Rest at room temperature until a crust forms, that is until you can lightly touch the uncooked macaron without it sticking to your finger. This will take between 2 to 6 hours depending on humidity in your area. Preheat oven to 150 C (300F). Once heated place macarons into the oven and reduce temperature to 130C (265 F). Bake for 10 -12 mins until firm to touch but not coloured. Remove from oven and cool on the baking tray. When macarons have cooled carefully remove from parchment paper. 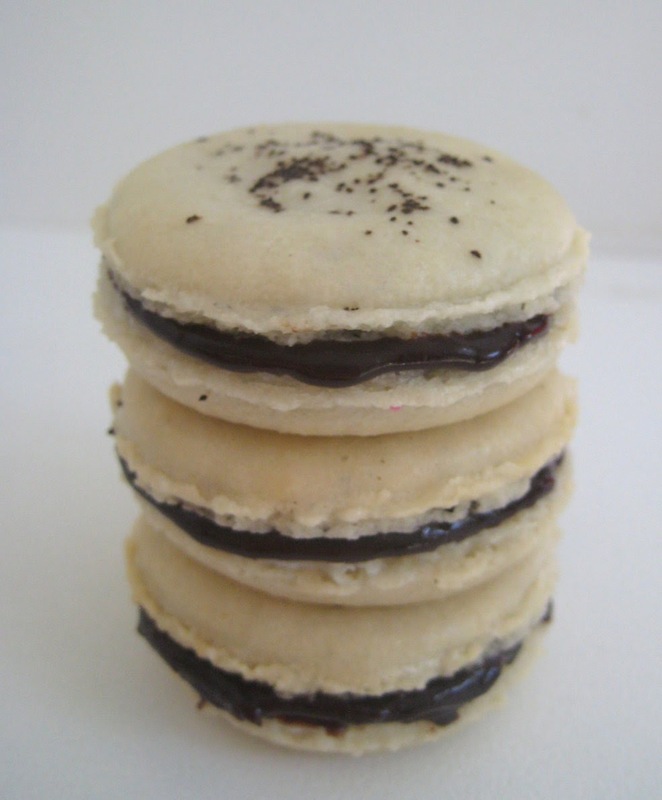 Match macarons in like sizes and sandwich together with filling. Bring cream to boil, dissolve coffee in cream. Pour over finely chopped chocolate and stand 5 mins. Stir until all chocolate has melted. Allow to set a little and use as required. Thank you so much for sharing. I will give them a try over the next few days. I will add to my blog if they work out. They look delicious, and so perfect! I'm surprised you succeeding in keeping them away, whilst resting, from 3 children! 40% off cookbooks? So glad I wasn't in the vicinity! You have a lovely baking site here. Can't wait to see what you make next. they look delish *drools* mine would never turn out like that though! Shoppe Girl - Thanks I hope yours work out but you should try my other recipe it usually works better for me. missklicious - thanks, it was tricky. Lorraine - I think it's easy to overmix. I think the other recipe I have gives a more stable result. 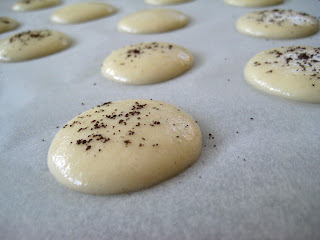 I enjoyed your post comparing the French macaron method to the Swiss or Italian meringue method. I think that the hot sugar method is always a bit more stable. The macs look lovely though.